Seaview Resort Bogaz is one of the best properties listed in Cyprus44 property reviews. Seaview Resort Bogaz is the brainchild of entrepreneur Ali Ozmen Safa, and his company PI Property International plc. Safa started his career renovating and selling property in the UK, before returning to North Cyprus and joining the booming off plan market. 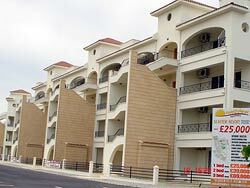 By 2007, his company will have competed on an impressive 1250 properties in North Cyprus. His local company, Medview Homes, manage properties in the Bogaz area of North Cyprus for a wide client base of investors and tourists alike. One of the most interesting innovations by PI Properties is to offer apartments on a guaranteed buyback basis, and this must be a major attraction of properties at the Seaview Resort at Bogaz, North Cyprus. The principle is simple; buy an apartment, rent it out or just use it yourself, and at the end of a five-year period, you can sell it back to the developer for the original price plus 50% profit, guaranteed. You keep any income from rental you've made, and if you want to keep the apartment, a small fee ensures the title deeds (and apartment) are finally yours. Medview Homes can manage your property for you as a rental investment on an individual basis or as part of a rental pool, and can even arrange finance on a 50% loan-to-value basis. Since the money-back and profit guarantee are both underwritten by an independent bank, it does seem to be a win-win scenario. So what does your money buy you? The apartments at the Bogaz Seaview Resort are just a five minute walk from the beach, in this rapidly expanding area of North Cyprus. Just down the main coastal road is the fascinating walled city of Famagusta, and the sweeping sands of Famagusta Bay. East lies the rugged and beautiful Karpas Peninsula, home to wild donkeys and nesting turtles, and to the south are the impressive ruins of the ancient city of Salamis. The apartments are part of the Seaview Hotel complex, which extends beyond the main building into the Amethyst, Jasper, Opal Sandstone and other apartment blocks. All blocks are within easy reach of the hotel's facilities, including the swimming pool, tennis and basketball courts, and the mini golf greens. There is plenty of parking, and the first blocks should be completed by late 2007. The Jade apartments have one bedroom and one bathroom, with six apartments to a floor, except for the third floor, which features two bedroom apartments. It has to be said, the apartments are not the most spacious in North Cyprus, more akin in size to hotel rooms, as one might expect. However, they have everything you need, from ensuite facilities to a small kitchen, and you'll be out in the sunshine far too much to worry about the size of the living space anyway! There are similar sized apartments in the Moonstone and Topaz blocks. The Sapphire block (formally know as Symfoni) have two bedrooms and two bathrooms, all situated in an elegant crescent of apartment blocks on the south of the site, enjoying views across the landscaped gardens to the hotel itself. ground floor terraces, balconies and roof terraces make these apartments ideal for sun worshippers who like to get a tan by their own front door! The Seaview Resort at Bogaz is an ideal North Cyprus holiday let investment for anyone who loves the sun, but does not want the hassle of expensive maintenance on a North Cyprus villa. The Seaview Resort at Bogaz is not the prettiest resort in North Cyprus, and Bogaz has some catching up to do to complete with Esentepe or the Kyrenia area in terms of facilities. However, your rental and management can all be taken care of, and if you don't like Seaview Resort after five years, you can walk away with a guaranteed 50% profit. How can you lose? This web page is served on 25 April 2019 at 23:14:22.